"I'm not that complicated as an actor.... I don't believe you can ever be someone else. You manifest different levels of your own personality to come up with a character. If you play a deaf mute, you pull out that aspect of your personality." The son of Shirley Douglas and Donald Sutherland, Kiefer William Frederick Dempsey George Rufus Sutherland was born a twin to his sister Rachel in London, England. A year later the family relocated to Los Angeles, but Donald and Shirley divorced shortly afterwards. Shirley took her three children to live in Toronto, and Kiefer spent much of his time at the theatres during his mother's rehearsals. He had no interest in acting while he was growing up, as his parents were both star performers in the industry. But when he was a teenager sitting in the audience for Who's Afraid of Virginia Woolf? he was mesmerized by his mother's portrayal of Martha, and his world turned on its head. Barely twenty-two years old, Kiefer married actress Camelia Kath in 1988, whom he had met on the set of The Killing Time. The couple had a daughter the same year, but their marriage ended after only two years. "I had an incredible desire at a very young age to want to be older than I was," Kiefer explained of his short marriage. "And one of the ways you can accomplish that is to say, 'I'm married, I have kids, I've arrived.' But those aren't the right reasons to do that, as we found out." 3 Kiefer and Cameila, however, split amicably and remained on good terms. Kiefer rebounded in a high-profile relationship with Julia Roberts. The two were engaged to be married in 1991, but called it off three days before the wedding amid a tabloid frenzy. But after spending two years working himself ragged on back-to-back film projects he didn't feel were worthwhile, Kiefer lost direction and earned a reputation for raucous party behaviour. Seeking self- improvement, he scaled back on filming and spent some time on a ranch in Montana honing his riding skills and venturing into the rodeo circuit. He returned to his theatrical roots in 1997, starring alongside his mother in Tennessee Williams' The Glass Menagerie at Toronto's Royal Alexandra Theatre. Still unhappy with his film work, however, he returned to the rodeo and took first place in the 1998 U.S. Team Roping Championships with partner John English. Kiefer returned to Hollywood after a two-year hiatus, where his friend Stephen Hopkins encouraged him to audition for the role of Jack Bauer in a new television pilot he was directing. 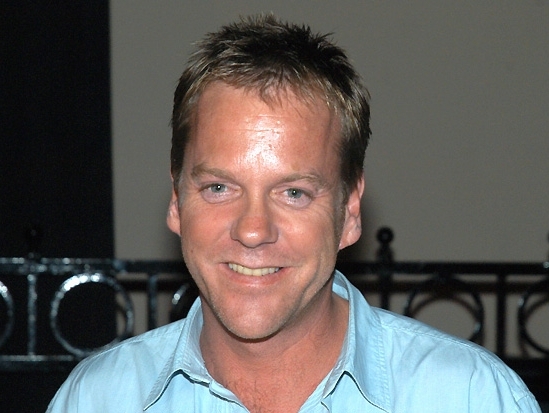 24 became an instant hit, and Kiefer's portrayal of the Federal Counter-terrorism agent earned him a 2002 Golden Globe for Best Actor in a Television Series. Although he hasn't won a second Golden Globe, he has been nominated in the same category for the same role every year since then. The role of Jack Bauer has also earned Kiefer the Screen Actors' Guild award in 2004 and 2006, and a Primetime Emmy for Outstanding Lead Actor in a Drama in 2006. After five seasons on 24, Kiefer signed a $40 million contract with 20th Century Fox to appear in three more seasons, making him the highest paid actor in television, and was promoted to Executive Producer.